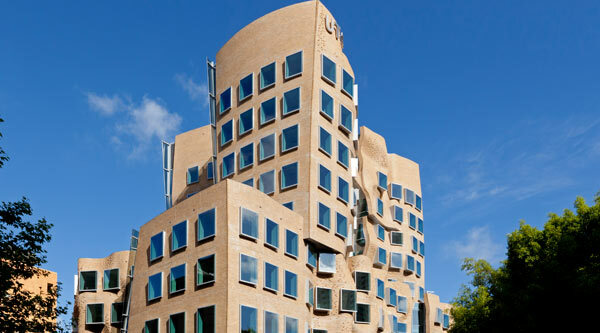 The building’s remarkable exterior is the result of its two distinct facades – one composed of undulating brickwork, referencing the dignified sandstone of Sydney’s urban heritage, and the other of a glass ‘curtain wall’ that mirrors fragments of the building’s contemporary city surrounds. The building’s interiors are equally striking. Gehry Partners designed the building from the inside-out in order to create internal spaces that inspire real and relevant research and learning outcomes. Its unique exterior combined with its thoughtful interior are a manifestation of the creative thinking that underpins the teaching and research undertaken by the Business School and, more broadly, the university. "Each of the larger lower floors is divided into six floor segments. The building façade folds in between these elements bringing natural daylight deep into the centre of the floors. "The façade of the building will have two aspects and two different personalities. The east-facing façade that contains an entry from the UPN (Ultimo Pedestrian Network, also known as The Goods Line) is made of a buff-coloured brick similar in colour to the Sydney sandstone. The form of this façade curves and folds like soft fabric. The brick will be set in horizontal courses and will step or corbel to create the shape. The texture of the surface will be rough and will emphasise the mass of the material. The shape flattens as it wraps around the north and south corners. Large windows punch this façade. 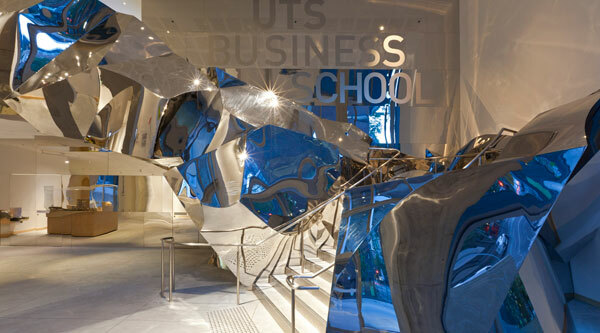 "The west-facing façade that contains the ground level entry off Ultimo Road is composed of large shards of glass façade. This glass will be slightly reflective to fracture and mirror the image of the surrounding buildings of the neighbourhood. Sculptural brick towers will stand at the northwest and southwest corners of this façade. "The ground floor of the building will have a café with seated dining that opens to additional outdoor tables on the sidewalk and proposed plaza to the north. A coffee bar with outdoor seating will animate the upper level entry off the UPN, conveniently adjacent to the student centre and the large student lounge. Connected via a staircase to the student lounge will be a more secluded graduate student lounge one level above. "The teaching and learning spaces, which are accessibly located on the lower four levels of the building, are comprised of various classroom types primarily serving postgraduate students." Explore some of the Dr Chau Chak Wing Building’s most notable design features inside and out or find out more here. Achieving the ‘fluid’ appearance of the brickwork was a technical feat that involved corbelling (stepping) individual bricks to articulate the building’s organic shape. The bricks – approximately 320,000 in total – were custom made for the building and laid by hand. The shape of the bricks and the groove in the middle also differ from standard bricks, with the majority of bricks joined by brick ties to the structural substrate panels beneath for reinforcement. To encourage interaction, the building makes prominent use of stairways to move people around the building. The most eye-catching of these is a polished stainless steel staircase, which lends a sculptural focal point to the main lobby and reflects the movement of both people and ideas. Another stairway, made of Victorian ash, wraps around an oval classroom, linking it to the student lounge on the floor above. An emphasis on creating a collaborative environment drove the design and fit-out of many teaching, learning and office spaces, particularly two oval classrooms and a collaborative theatre designed for technology-supported interaction. Collaborative study rooms are incorporated for group-work, while plentiful space for less formal collaboration is included in the form of student and staff lounges, coffee hubs, cafes and outdoor terrace areas. The building has a 5 Star Green Star design rating from the Green Building Council of Australia, with sustainability considered throughout in the choice of construction materials, interior furnishings, sustainable timber and air-conditioning. A 20,000-litre roof tank harvests rainwater for use in toilets and irrigation, reducing potable water use, while the basement has 160 bicycle parking spaces. Find out more about the building's sustainability features. © Copyright UTS - CRICOS Provider No: 00099F - 04 December 2017 04:17 PM. The page is authorised by Director, Marketing and Communication Unit.